Thorium is a relatively common radioactive element in the actinide family. In pure form, it is a soft silvery-white metal with properties very similar to lead, and can be shaped rather easily under proper conditions. The abundance of thorium within the earth’s crust is much greater (15 ppm) than other radioactive elements, particularly uranium. This makes thorium an attractive candidate for lowering the cost of nuclear power sources in the future. Thorium is typically isolated by converting a sample of monazite or thorite to thorium dioxide, and then heating the compound with calcium; which, if desired (e.g. breeder reactors), can then be transformed into various synthetic isotopes of uranium through neutron bombardment. Only one thorium nuclear reactor was ever built (1979) and due to numerous economic and technical problems, shut down after only a decade. The native characteristics of thorium lend itself to a number of compounds with industrial and consumer applications. In fact, thorium is the only radioactive element besides uranium with non-radioactive applications. Central to these applications is its ability to maintain strength at high temperature. In some magnesium alloys, thorium is used in aircraft engines and rockets. Oxidized thorium is used in arc welders. Compounds such as thorium dioxide and thorium nitrate are used in various lights and lamps as a brilliant white light source when heated with a gas flame. Thoriated tungsten elements are contained in filaments of magnetrons, most commonly exemplified in microwave ovens and radar systems. Furthermore, thorium dioxide is utilized in many ceramics and glasswork applications. Thorium dioxide is known to increase refractive index in glass, thus has many applications in optical lenses for cameras and scientific apparatuses. Thorium fluoride is used as an optical coating, and the list goes on. Although exposure to small amounts of thorium in applications such as those listed above is considered safe, thorium-based products have begun to fall out of favor (2000s) due to its perceived biological danger. The element was discovered in 1828 by Swedish chemist Jons Jakob Berzelius, at a time when the concept of radioactivity was not yet known. It was first recognized as a radioactive element as a result of English chemist Gerhard C. Schmidt and Marie Curie’s radioactivity research in 1898. There are 27 known isotopes of thorium, all radioactive. The isotope with the longest half-life is 232Th, at a staggering 14 billion years, which explains this primordial radioactive element’s relative abundance on Earth. This particular isotope decays into 228Ra through alpha decay; other elemental decay products of thorium isotopes include radon and actinium. Thorium is a lanthanide (rare earth) material with potential nuclear power applications. It is presently used as a tungsten coating in electronic parts due to its high emission factor. In its fluoride and oxide forms, Thorium is used in advanced optic applications for its high refractive index. It is also used in several other high temperature glass applications, such as in the mantle of lamps and to produce crystal growth crucibles and ampules. 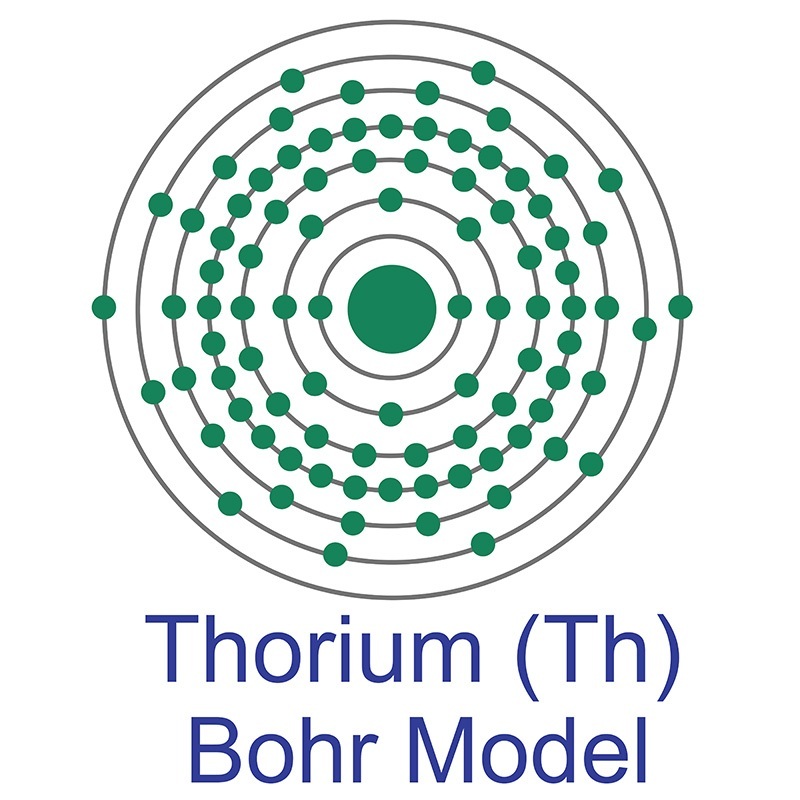 Thorium is available as metal and compounds with purities from 99% to 99.999% (ACS grade to ultra-high purity). Oxides are available in powder and dense pellet form for such uses as optical coating and thin film applications. Oxides tend to be insoluble. Fluorides are another insoluble form for uses in which oxygen is undesirable such as metallurgy, chemical and physical vapor deposition and in some optical coatings. Thorium is also available in soluble forms including chlorides, nitrates and acetates. These compounds can be manufactured as solutions at specified stoichiometries. Thorium is a Block F, Group 3, Period 7 element. The number of electrons in each of Thorium's shells is 2, 8, 18, 32, 18, 10, 2 and its electron configuration is [Rn] 6d2 7s2. The thorium atom has a radius of 179.8.pm and its Van der Waals radius is 237.pm. In its elemental form, CAS 7440-29-1, thorium has a silvery, sometimes black-tarnished, appearance. Thorium was first discovered by Jons Berzelius in 1829. It is found in small amounts in most rocks and soils. The name Thorium originates from the Scandinavian god Thor, the Norse god of war and thunder. Thorium is radioactive and can collect in bones which may cause bone cancer several years after exposure. Breathing in substantial amounts of thorium may be lethal. Safety data for Thorium and its compounds can vary widely depending on the form. For potential hazard information, toxicity, and road, sea and air transportation limitations, such as DOT Hazard Class, DOT Number, EU Number, NFPA Health rating and RTECS Class, please see the specific material or compound referenced in the Products tab. The below information applies to elemental (metallic) Thorium. Thorium (Th) has six naturally occuring isotopes. None of these are stable; however, 232Th is observationally stable with a half life of 14.05 billion years.